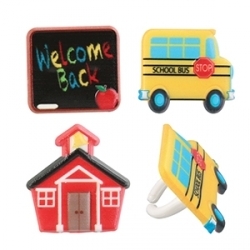 This set is a great way to deliver messages on your special occasions to your lunch box. 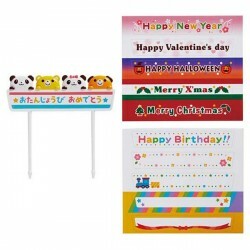 1 wide and long food pick, panda bear and animal friends design, with 10 different messages and blank stickers. 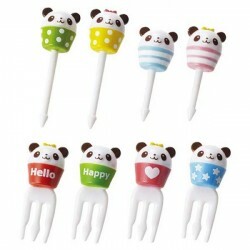 8 pieces of cute panda food picks and fork in fun and colorful cups design. 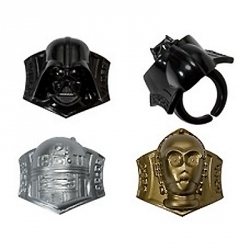 Japanese bento accessory. 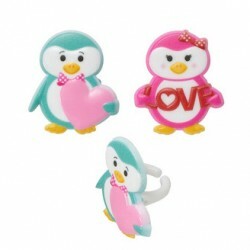 cute food decorating rings, Penguins in Love series (2 designs assorted), 8 pieces per set They are about 1.35 inches wide. 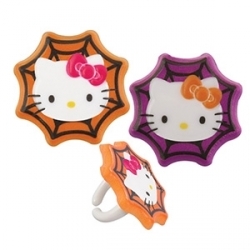 Circus themed food picks make any meal, lunch box, party fun. 18 pieces included. 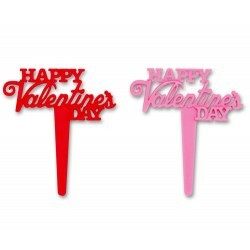 8 pieces assorted 2 colors flat Happy Valentine's Day series. 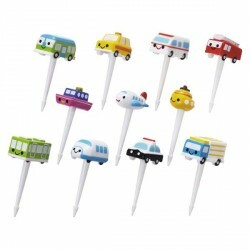 This food pick set is a great addition to a complete lunch or bento. 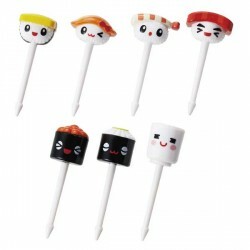 It contains 6 picks, designed as cute little 3D faces. They are very cute. 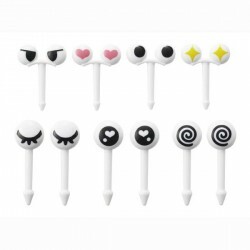 10 pieces, fun eyes bento food picks, series II, also great as mini cupcake decoration pick. This set includes 2 different sizes of eyes, 7 designs included, for example, sleeping eyes, in-love eyes, swirl confusing eyes, and more. 7 pieces of cute sushi-shaped food picks including tamago (sweet egg sushi), salmon, ebi (shrimp sushi), makuro (tuna sushi), ikura (salmon egg sushi), kappamaki (sushi roll), and green tea cup. 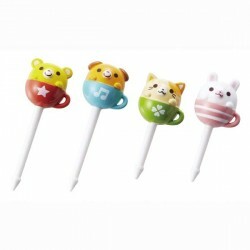 8 pieces of cute animal food picks in fun and colorful tea cups design. Japanese bento accessory from Japan. 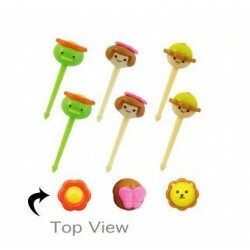 Food picks are also great for party, used to decorate rice balls, sandwiches, fruit, vegetable, cupcake, and more. 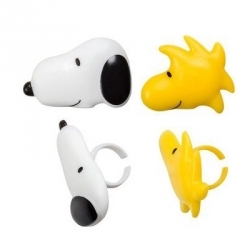 This animal food pick set is a great addition to a complete lunch or any meal. 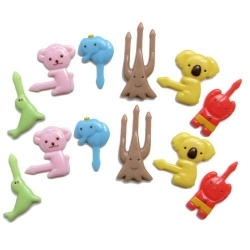 It contains 12 picks, designed as monkey, elephant, koala, and so on. They are very cute. 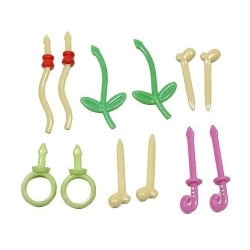 This food pick set is a great addition to a complete lunch. 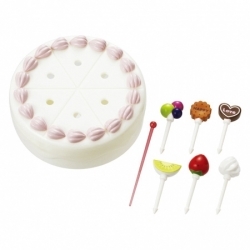 It contains 12 pieces of food picks, vegetable series. 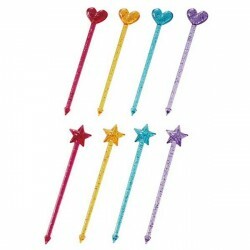 They are in different length for the easy use of different types of vegetable or food. They are very cute. 2.75 inch long. 15 pieces set. 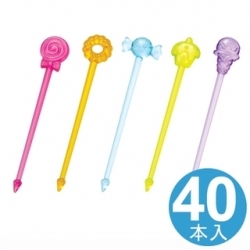 Long Pin Japanese Food Pick. 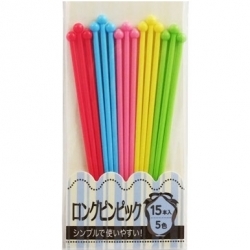 Come in a pack of 15 colorful long pin food picks. light blue, pink, red, yellow and green colors assorted.